This is an index for those veterans and widows of veterans who filed application for pensions based on military service in all branches of the military during the War of 1812. This is one of the most informative indexes ever published on National Military Records. This revised edition also contains a cross-reference index of 58,126 entries to the wives, widows and other family members as shown in the main index. The wives and widows are indexed under their maiden name when same was available. Many of the entries will contain all or most of the following; name of veteran and any aliases used, maiden name of widow or wife also maiden name of previous wife or wives, name of widow's or wife's previous or subsequent husbands, date and place of marriage, date and place of death of both veteran and widow or wife, application number or if the claim was approved the certificate number is provided for both the veteran and widow when applicable, application numbers are also given for applications for pension based on service in other wars and conflicts when same was shown in the records which was really quite often, Bounty Land Warrant numbers are given for applicants who applied for Bounty Land but did not apply for a pension and whose records were interfiled with the War of 1812 pension applications, name of unit or units served in, counties and states of residence of both the veteran and widow also sometimes the name of the city will be given. 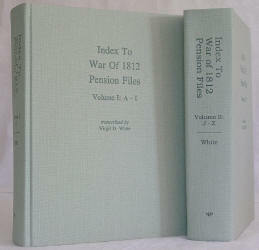 A few claims were filed from foreign countries and the name of the country is provided as shown in the War of 1812 Pension Application Files. There is also other miscellaneous information provided as shown in the microfilm records. Some of the entries give the rank of the veteran during his military service, some give the name of a person hiring another as a substitute for his military service. There are cross-references to files in other series as well as cross- references for entries under more than one spelling. The surnames are in BOLD CAPITALIZED PRINT. This is really a beautiful set of books. There is a tremendous amount of genealogical data supplied in this index. Every library' as well as all historical and genealogical societies should have a copy of these books. This index was prepared from records located at the National Archives. Many of the entries will contain; name of remarried widow, date claim was filed, application and certificate numbers, name of husband upon which her claim was based, names of other husband or husbands, military service of each husband as well as application and certificate numbers for each husband when applicable, cross- references to other claims filed by the widow, also interfiled in this index are some claims by minor or helpless children, mothers, fathers and sisters of serviceman. The majority of these claims are for the Civil War however there are several thousand for other wars and conflicts, there are a few claims based on Rev War and pre War of 1812 service and some of the later claims also refer to additional service in World War I. This book also contains a cross-reference index of 54,544 names of other people referred to in the main index. The "Old Wars" pension application files are for service based on death or disability incurred in service in the US Army, US Navy and US Marine Corps between the end of the !Revolutionary War and the first year of the Civil War in 1861. The claims are for service in the Mexican War, the Indian Wars, the early part of the Civil War and a few are for service in the War of 1812. 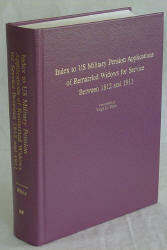 This revised edition contains an additional cross-reference index of 10,438 names of widows (often times she will be listed under a subsequent husband's surname), widow's previous or subsequent husbands may be shown, veteran's father, mother or dependent sister may be shown in some of the entries. The entries in the cross-reference index are the full names of each person. There is much more service data provided in the revised edition than in the first edition. 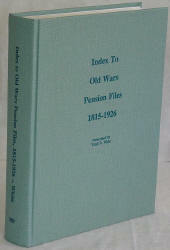 The "Old Wars" series contains approximately 26,000 entries. These files are most often overlooked by the researcher because of the mistaken belief that if a claim was filed for service in a particular conflict or war, the claim would be in that series, however if the claim was filed because of death or disability it would most likely be in the "Old Wars" series. If a soldier was killed or disabled because of reasons other than hostile action, the "Old Wars" files should definitely be researched. The "Old Wars" files should be researched by everyone doing research between the mid 1700s and the early 1900s. The information varies considerably in the entries. The entries can contain all or part of the following; name of soldier and any aliases used, name and class of dependent if any, name of war or wars or time frame, application and file numbers or the certificate number for an approved claim, state or country from which the claim was filed, date claim was filed and other miscellaneous data. Several of the entries give the date and place of death of the veteran and some give the date of death of the widow. The surnames for the entries are in BOLD CAPITALIZED PRINT. There are cross-references to claims in other series. This index was prepared from records located at the National Archives in Washington, DC and from records located in the Government Document Libraries of several universities, towit; The University of Memphis, University of Tennessee, The University of North Florida and others. This book contains the names of the men who received the 3400 Medal of Honor awards from the Civil War when the medal was created and through the end of the Vietnam War era in 1978. A few of the men were awarded two medals for different acts. There were also eight medals awarded to Unknown Soldiers. The entries contain the name of the individual, his rank and unit or ship served on as well as branch of service, date and place of extraordinary or heroic act, if the medal was awarded posthumously it is so noted, many entries will give the date and place of birth of the recipient and where he entered military service, the name of the war or disturbance and if for conduct during peacetime it is so noted, many entries will show if the recipient was wounded, some of the entries will give a very brief description of the act of heroism, etc.